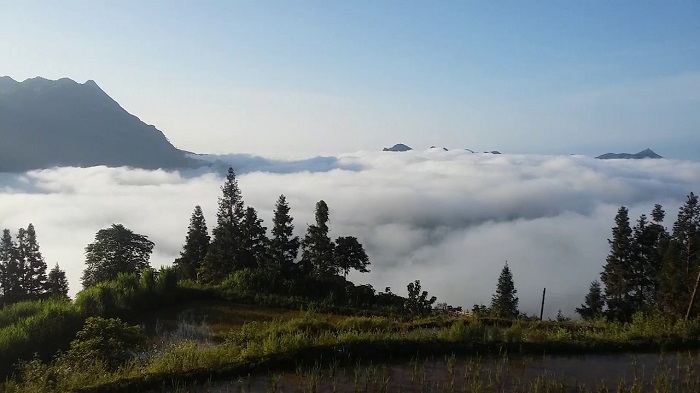 Those who wish to experience a slow pace of life should head to Hoang Thu Pho Commune in Bac Ha District in the northern mountainous province of Lao Cai. 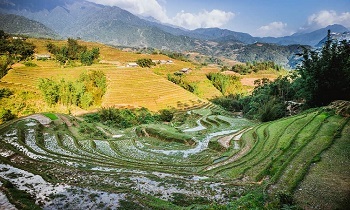 According to Sapa Hanoi tour review, this is a beautiful and suitable place for adventures to explore the pristine landscape and intact traditional lifestyle of local people. Bac Ha is one district located in Lao Cai’s Northeast, the north borders with Si Ma Cai district, the South borders with Bao Yen and Bao Thang district, the East borders with Xin Man district (Ha Giang), the West borders with Muong Khuong district. Bac Ha district is located in the height from 1,000 to 1,500 m in comparison with sea level, has temperate climate. Annual average temperature is 25°C. 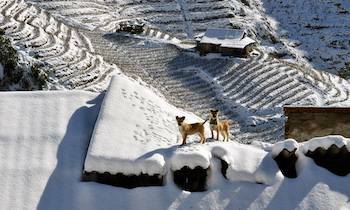 Bac Ha’s terrain has many limestone mountains; average slope is from 24 to 28°. Bac Ha has width of 682 km², its population is about 56,77 thousand people, the density is 83 people/km2, with 14 ethnic groups living here in which Mong ethnic group holds upper 47% population of whole district. Other ones are Kinh, Dao Tuyen (Man Den), Tay, Nung, Phu La, Hoa, etc. 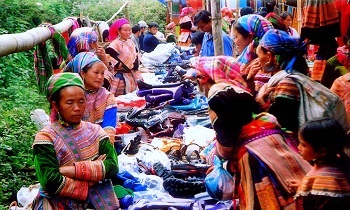 Bac Ha includes 01 Bac Ha town (district capital) and 20 communes. From the center of Bac Ha District, tourists can take a motorbike drive on a 12km journey to get to Hoang Thu Pho to admire beautiful landscapes on either side of the street. 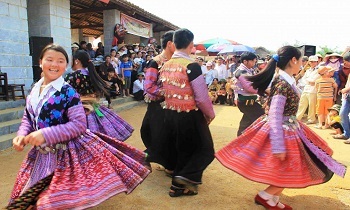 Hoang Thu Pho is home to a large community of Mong ethnic minority people and is known for its ancient snow tea trees in the forest and plum and peach fruits. Once arriving at Hoang Thu Pho, people can feel a pleasant weather which helps refresh their minds and souls. There are majestic mountains rising to the sky and majestic forests. Hoang Thu Pho looks like a painting of an immense green of trees, corn and rice fields and a harmonious combination of nature and life that wait to be discovered. Tourists seem to release all of their worries and burdens to explore this romantic land with sounds and melodies of mountains and streams running through and birds singing in the jungle. 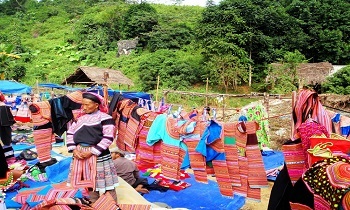 It is a highly recommended experience to walk on a path leading to the center of the commune to explore daily life of Mong ethnic people on the mountain. Leisurely standing on a mountain and looking over surrounding areas might bring tourists a slow pace of life. 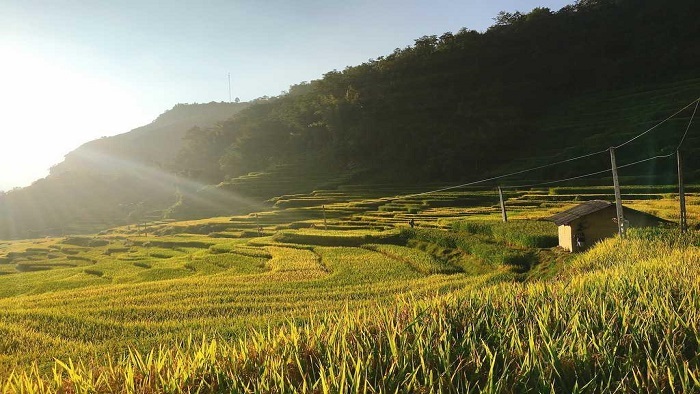 People can find beautiful landscapes and weather all year round in Hoang Thu Pho with stunning terraced rice fields and plum and cherry blossom in full bloom. Tourists can experience a homestay service at Mong people’s wooden houses by the stream to have peaceful time for their mind and to breath in fresh air of a wild nature. At night time, they can enjoy corn wine and char-grilled chicken served with cham cheo, a special kind of salt of Mong people, or sticky rice served with roasted chicken with ginger and grilled pig. Local people in Hoang Thu Pho are known for their great hospitality with warm handshakes and big smiles on their faces towards tourists. This is one of the beautiful roads of Bac Ha and is always praised by trekkers. 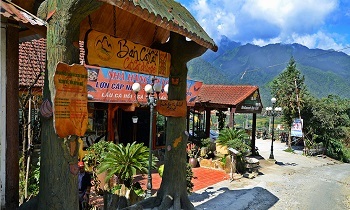 With a total length of about 12km from the Bac Ha town going through Ban Pho and to Hoang Thu Pho. 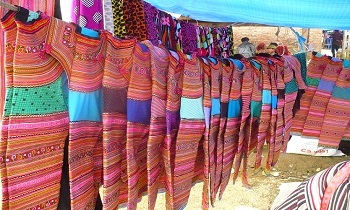 Ban Pho is one of the most beautiful Hmong villages in Bac Ha, only 3 km from the town center. Tourists can enjoy the beautiful view of the village with houses that are scattered and spread from the middle of the mountain to the valley. Below is a lush green valley of corn and rice. If trekking in the spring, visitors can admire the plum forests blooming white all over the region. All create a strange poetic beauty. Going through Ban Pho to Hoang Thu Pho, you will have the opportunity to see an extremely majestic natural scenery of the northwestern mountain and forest hidden under the sea of ​​clouds. The terraced fields wind around the mountainside, in the season of ripe rice, this place is beautiful like a painting. Visiting Hoang Thu Pho is like a trip to a wonderland where human being and nature is mingled with each other. 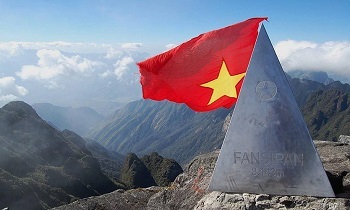 If you need more information about Sapa hiking tour, let’s contact us via our website. Thank you!